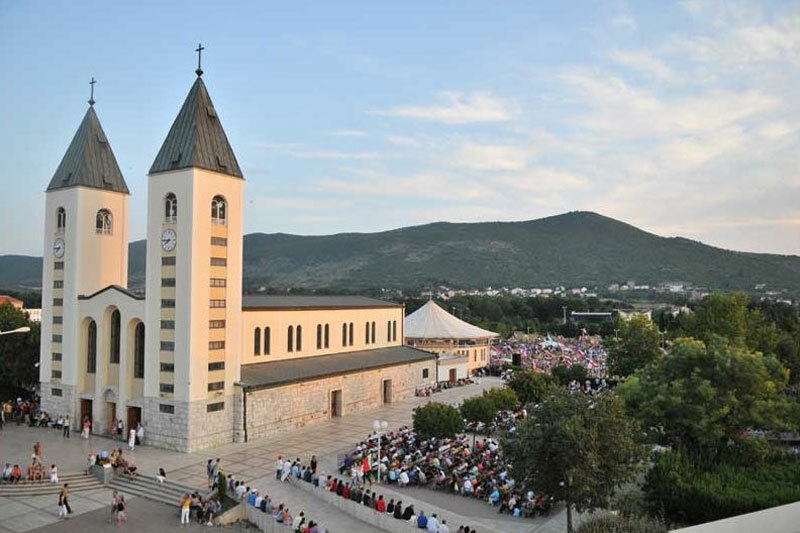 St. James’ s church is the most important place in Medjugorje for all the pilgrims. It has been constructed in 1980. and since then in has been a place of prayer for many people from all around the world. The evening program starts at 5pm with the rosary, at 6pm is the mass which is simultaneously translated in many world languages, after the mass is the healing prayer and adoration of the cross. The apparition hill where Our Lady Virgin Mary first appeared back in June 1981st. to six small children. 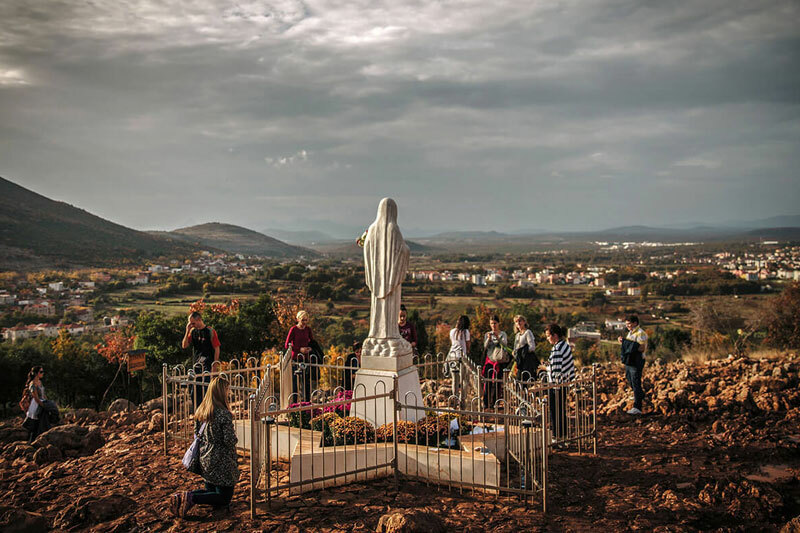 Up until now it has been visited by milions of pilgrims from all around the world, each of them took a small stone to their home or country as a memory to Medjugorje, the small place chosen by Our Lady Virgin Mary. 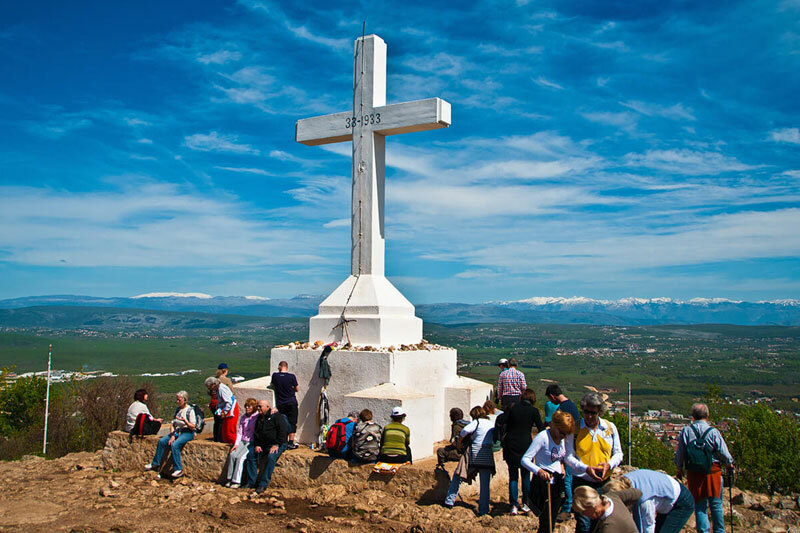 The Cross mountain where the big white cross was built to honour our Jesus Christ, by the parish people back in 1933. as a Cross Mountain is a mount above Medjugorje (520 m) where on March 15, 1934, the parishioners constructed a concrete cross 8.56 m high, built in remembrance of the 1900 years since the death of Jesus. On the cross is written: “To Jesus Christ, Redeemer of the human race, as a sign of their faith, love and hope, in remembrance of the 1900 years since the death of Jesus”. Kravica waterfall is a large tufa cascade on the Trebižat River, in the karstic heartland Herzegovina in Bosina and Herzegovina. It is 15 kilometres away from Medjugorje. Its height is about 25 metres (80 ft) and the radius of the lake in the base of the waterfall is 120 metres (390 ft). Kravica is a popular swimming and picnic area and, during the summer. 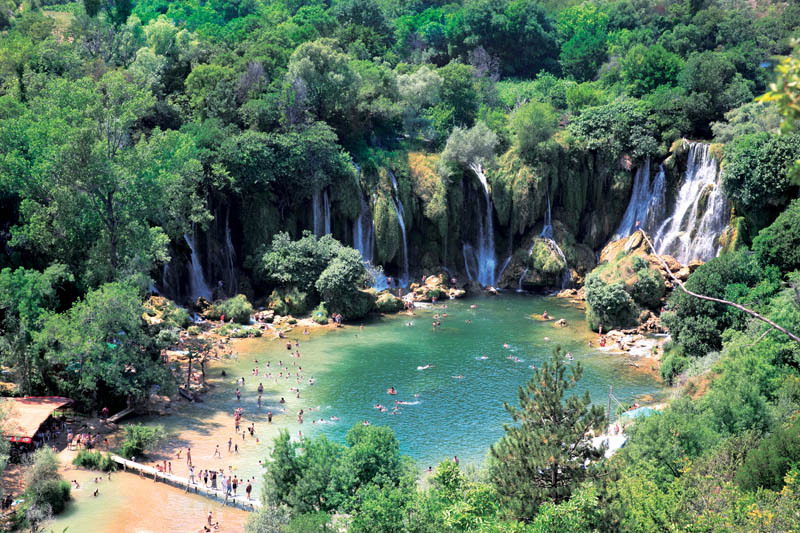 The Kravica Falls area also has a little cafe, a rope swing, a picnic area, and a place to camp. The best time of year for visiting is during the springtime when the fall is at its fullest and the arid landscape turns a bright green. During the high season, various restaurants in the vicinity of the waterfalls mostly offer grilled dishes and fish specialties. 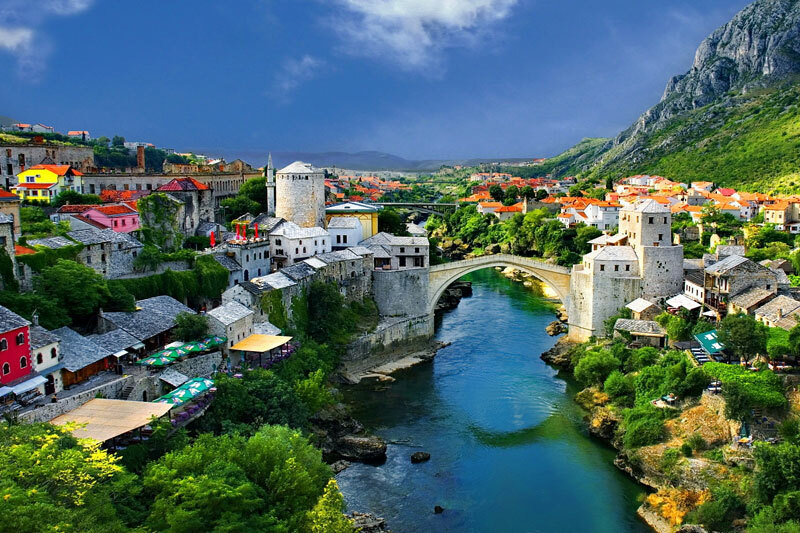 The Old Bridge (Croatian: Stari most) is a 16th-century Ottoman bridge in the city of Mostar that crosses the river Neretva and connects the two parts of the city. The Old Bridge stood for 427 years, until it was destroyed on 9 November 1993 by Croat forces during the war. The Old Bridge was recently rebuilt and many of the edifices in the Old Town have been restored or rebuilt with the contribution of an international scientific committee established by UNESCO in 2004.